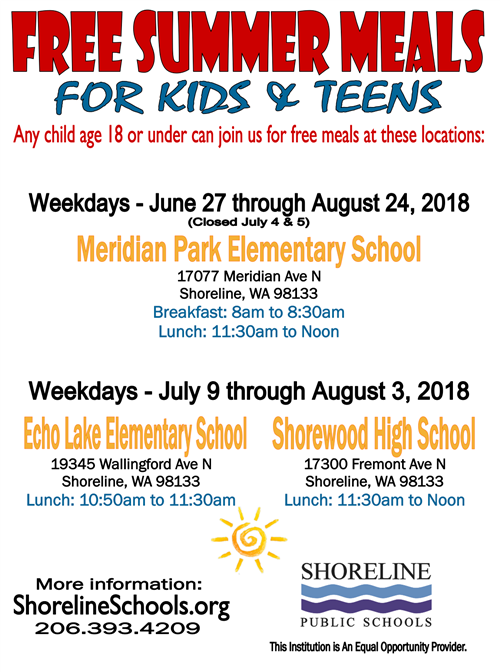 This summer, Shoreline Public Schools will host a FREE summer meal program for children 18 and younger. Lunch will be available at all three locations, but breakfast will be available only at Meridian Park Elementary. Any child 18 and under can come to one of these locations for a free meal. There is no registration or application required. Children do not need to be a Shoreline student. For additional information, call the Food Services Department at 206-393-4209.